A successful medical practice requires comprehensive medical software that serves to maintain any and all records. At Coast Medical Solutions, we provide you with the best software for practice management, electronic health record maintenance, and electronic prescribing so you can achieve your goals. Coast Medical Solutions specializes in the installation, maintenance, and support of your software and infrastructure, including software that we have not provided to you ourselves. We transform the processes of PQRS/CQM compliance and reporting into a flawless experience, ensuring easy use and superior quality for electronic health record (EHR) system incentives. 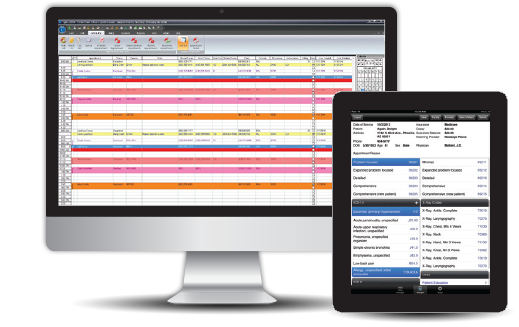 Scheduling: Scheduling is made easy with the multi-view calendar that minimizes clicks with familiar functionality. With this scheduler, you can find the best appointment fast to meet both your practice’s needs as well as the needs of the patients. Lytec® 2015 simplifies all of your scheduling, making more time for optimal patient care time. Billing: With customizable rules-based grids, claims are generated that allow your practice to address the filing requirements of different carriers. The flexible grid system allows for an infinite amount of claim submission situations as well as the ability to make future payer changes and government mandates. Lytec Mobile: You can run a smarter practice using this no-fee application for the iPad®, iPhone® and Android™ with access to vital information about the performance of your practice anytime and anywhere. Lytec now includes patient intake in order to reduce data entry time on your mobile device. Everything you need to do optimize the running of your practice is at your fingertips. Revenue Management: Track, collect and measure payments for the services provided in record time. With this, you are able to check for errors with a pre-claim editing feature before submitting claims for payment. In addition, Lytec® 2015 also checks for insurance eligibility before any services are rendered. Review our Lytec® 2015 systems and contact us for a quote. Read our full review of Lytec 2015. Contact us to learn more about our McKesson Practice Choice® systems. Bright Note Technology™: Using a provider’s preferred data entry method—including templates, speech recognition, transcription, digital pen, dictation and web-based patient data entry—Bright Note Technology™ enables physicians to complete the patient chart from a single progress note. When the physician saves the note, searchable data automatically populates the various areas of the chart. Blue indicators show that information is contained within a particular tab. Provider Dashboard: The Provider Dashboard allows physicians to view all critical information (messages, incoming results, daily patient schedules) in one place. Additionally, a review bin provides fast and easy viewing of interoffice messages, notes, documents and lab results. Reporting: Searchable patient data is automatically generated to quickly produce meaningful clinical care reporting. The reporting capabilities of Lytec® MD help position users to qualify for incentives designed to encourage the adoption of EHRs, including pay-for-performance, Medicare ePrescribing and those built into the American Recovery and Reinvestment Act. Contact us to learn more about our Lytec® MD systems. Online eBill: Send paperless bills securely through MyProviderLink.com as well as customize messaging and payment methods. Payers may also see current and past bills online. Print and Mail: Send professional printed bills through USPS as First-Class Mail and simplify the process of paying with return envelopes and payment coupons. In addition, approved bills are mailed the following business day. Online ePay: Payments can be made online through MyProviderLink.com and ePays are included in your consolidated payments report. In OfficePay: Easily process phone, walk-in and mail payments. It also allows for payers to see OfficePays online at MyProviderLink.com. Contact us for more information on BillFlash© or to request a quote. Regardless of the unique needs of your practice, Coast Medical Solutions can provide you with hassle-free options that will allow you more time to focus on what matters most: quality patient care. To find out more about what medical software solutions we can provide, contact us or fill out our form today.